Having finally finished our self-build project (which you’ll be hearing more about over the coming months), the whole process has opened our eyes to many aspects of the home, both inside and out. One area we spent a great deal of time on was the interiors. 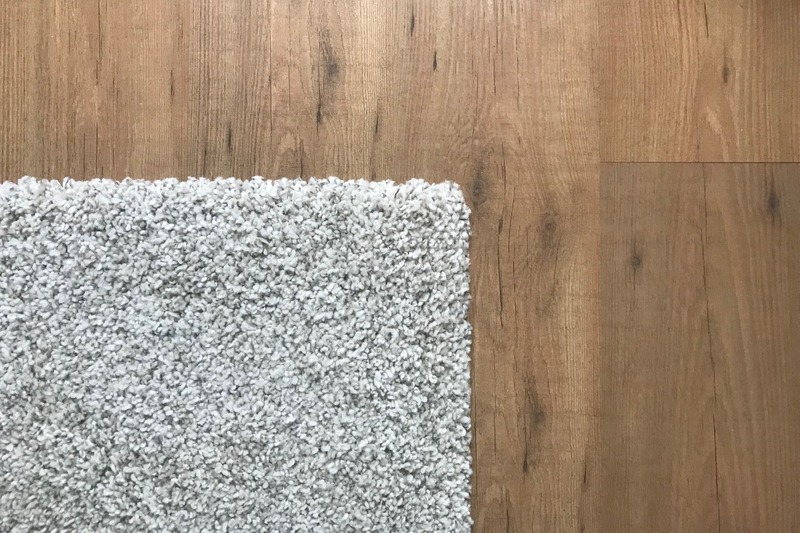 From upcycling old furniture (in some cases, pieces which were over 100 years old) to really taking our time over things like the flooring, wall tiles and carpet – ensuring your home makes the right statement to guests is huge. If there is one place that this is certainly the case, it’s the hallway, as for many of us, this is the entrance to your home. Sadly, it can often be a neglected area. 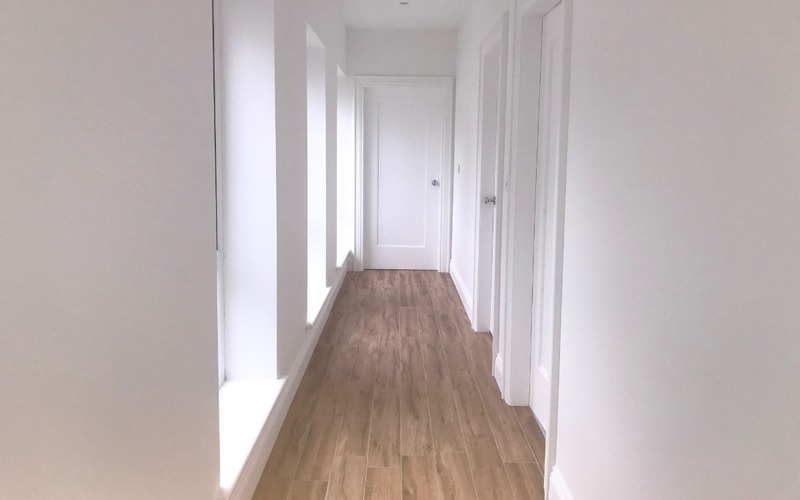 As well as being a first area for visiting guests, the hallway is also a go between for many rooms in your home, meaning they are a high-volume area. Despite this, the hallway in many homes is rarely seen as a priority for a facelift. That usually goes to the kitchen, bathroom or bedroom (although facelifts are something we don’t plan to be doing for a long while yet). Your hallway should be making the best first impression possible, because it’s where opinions on your home are built. We’ve tried to keep things to a minimum in our hallway, opting for a double height ceiling and open stairway to make the impression on people entering the house. We appreciate not everyone is in the position to build a new home and it can be a case of improving what is there, something we had to do with our old home on many occasions. 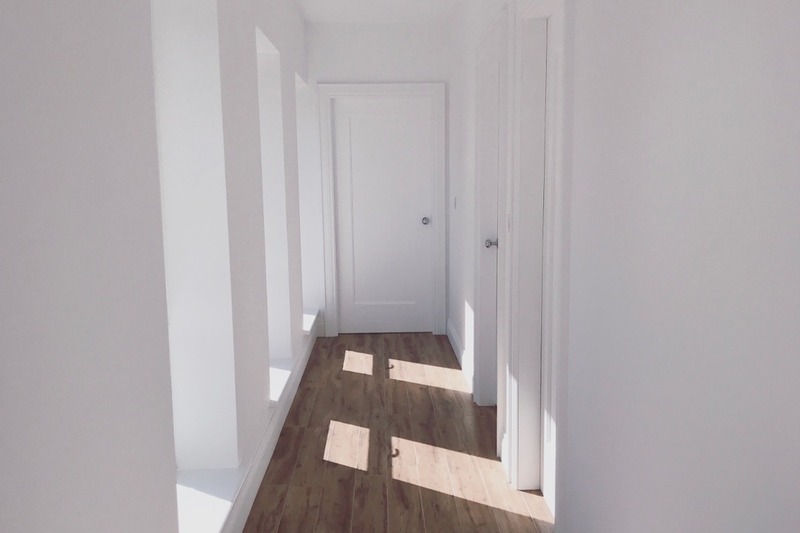 Upgrading your hallway, and indeed any part of a house can be expensive, but with Christmas quickly approaching, the hallway is one area you might want to consider giving a facelift. With that in mind, check out our top five cheap upgrades that your hallway could use. Your New Best Friend. The heaters in the hallway aren’t always that pretty to look at, especially if you have an open fireplace in the main lounge. They pale in comparison, really. The best thing that you can do on a budget is to build or buy pretty radiator covers. Not only does it prevent you from having to look at the heater, it means that you can use it as the perfect place for a letter holder or key dish! We’ve went with underfloor heating downstairs in our new home but with radiators exposed upstairs, radiator covers is something we have invested in. A fresh coat of paint can breath new life into a hallway. Hallways can be small and narrow and rarely well-lit. You need to give your hallway a new lease of life by adding a fresh lick of paint to the walls. You could choose to wallpaper the walls if you want or maybe opt for a feature wall, but a light, airy colour can open up the space and make it look brighter even when it’s not the brightest place in the home. High Traffic, Low Maintenance. The flooring in the hallway is going to see a lot of footfall with people coming in and out. Adding a hall runner on top of a carpet isn’t going to protect the carpet entirely from mud and debris. Laminate flooring can be a great way to deal with high volume traffic and add a new element to your hallway. We opted for laminate in our upstairs hallway going with Factory Direct Flooring laminate flooring. Laminate flooring is easy to clean and comes in lots of classy styles, and is pretty durable. Downstairs we opted for a wood effect tile in the hallway to give a modern, welcoming feel to the house. 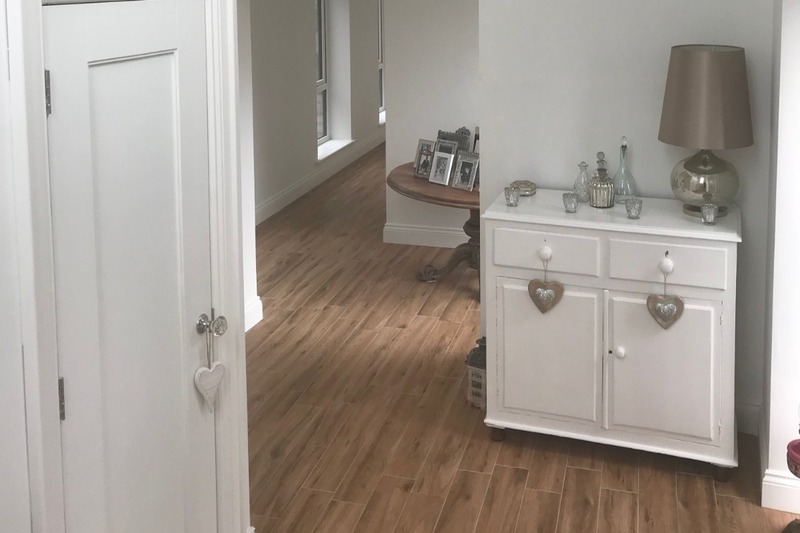 Paintings and photos can do so much to lift a hallway, and it’s something we’ve incorporated into not only our hallway, but many rooms in the house. Paintings can become a real statement piece for a room, and in the case of a hallway and provide a great talking point as soon as visitors arrive to your home. You could even consider adding artistic 3D pictures to the walls or large murals leading to the main rooms. Go bigger for maximum impact and the best possible first impression. Mirrors can also make a great impression to visitors, and can often make smaller hallways feel much bigger. Visitors to our home will notice lighting plays a huge part in the overall ambiance of the home, and in particular, the hallway. Whether you choose lamps or chandeliers, you need your hallway to be well-lit and inviting 365 days a year. You don’t have to splash the cash here, though. 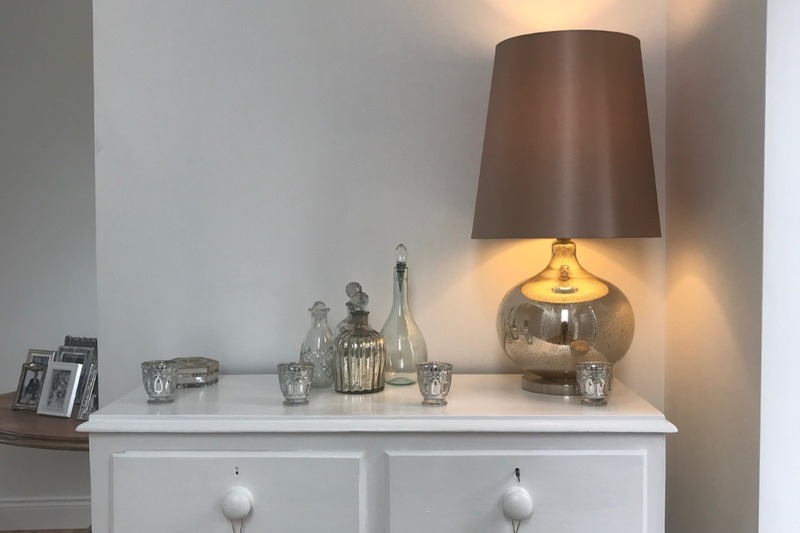 You can find some great bargains at charity shops and car boot sales, and old lamps can make the perfect DIY project to add some character to your hallway. Make your home’s first impression a great one – you won’t regret it. What have you done to make your hallway stand out and make the right first impression? Share your tips in the comments section below and let us know how you’re making an impact with your hallway. Until next time, let’s make an impression with those hallways.